Lori McKenna has some advice for you. Yes, you should listen. No, you don’t really have a choice. Yes, it might be unsolicited but yes, it will most likely change the way you see yourself, your life, and the people in it. 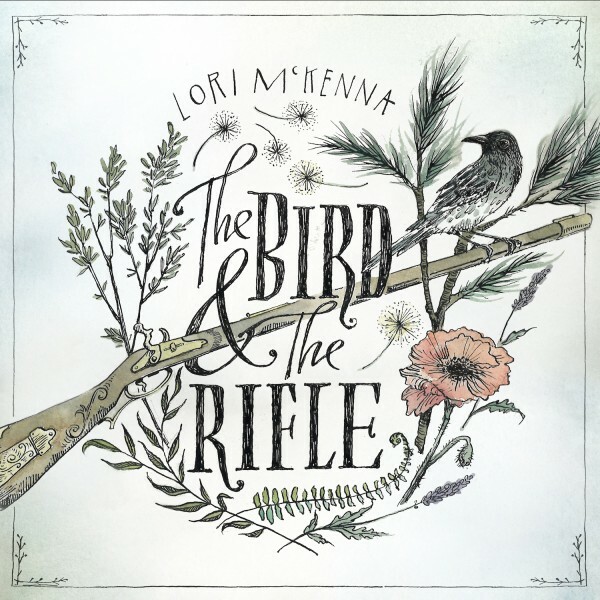 It comes neatly bundled in the form of McKenna’s tenth solo studio project, The Bird & the Rifle, released today. McKenna is fresh off a banner year of “Girl Crush” accolades, and this time around, she’s teamed up with producer-of-the-moment Dave Cobb for a powerful ten-song collection. Like most of Cobb’s projects (Southern Family, Jason Isbell, Chris Stapleton), The Bird & the Rifle demands several listens: a few to digest McKenna’s layered storytelling, a few more to appreciate Cobb’s just-enough production. She is self-aware and reflective throughout, all-knowing and wise but never pushy with her revelations. She gives the impression that she’s putting these lessons learned to music as much for her own benefit as for her audience’s. McKenna’s lyrics, as always, are impeccably tight – even the title track, which could drown in its metaphor but instead escapes with a clean-yet-complex storyline. With Rifle‘s tracklist, she’s achieved the elusive balance between personal and universal. Each song boasts a lesson or insight (or twenty, as is the case with “Humble and Kind”), and the words are seemingly ripped from the pages of her diary… or maybe, it’s your diary, or perhaps it belongs to someone McKenna met at a highway rest stop. Regardless of where they originated, McKenna’s messages are always relevant, sometimes hard to hear, and never judgmental. With Cobb’s artful augmentation, McKenna dodges between singer-songwriter (“The Bird & the Rifle”), honkytonk performer (“Old Men Young Women”), and stadium-filling rock star (“We Were Cool,” “All These Things”). She dips her toes in different pools, but clearly knows who she is as an artist, storyteller, woman, and mother. She sings with a casual confidence, very matter-of-fact but well aware of the weight of her words. And she’s really hoping you won’t make the same mistake twice. A jarringly simple and self-aware look at fatal flaws and miscommunications that have disintegrated a once-loving relationship. McKenna, along with cowriters Caitlyn Smith and Troy Verges, writes of a woman’s long-awaited escape from a toxic relationship. But what’s perhaps even more important than the story is that she never once condemns “the bird” for falling for “the rifle” in the first place. It’s proud and critical at the same time – she appreciates feelings of nostalgia but is careful not to over-glorify the past. The geographic location of Davidson County makes the message tangible, but has absolutely nothing to do with the fact that you, the listener, living a million miles away in Indiana or Florida or Colorado, deserve better. If this entire song is gold, the last verse is 24 karat. It stops you in your tracks and next thing you know you’ve shut off the A/C and you’re eating your third root beer popsicle. A fond look back on the beginnings of a relationship that celebrates the hopeful highs but doesn’t ignore the hardships and lows. Yes, this is mostly about trophy wives and gold diggers. But, if you listen carefully, it’s also a general commentary on relationships in which person is simply at a completely different life stage. An uptempo, whimsical illustration of the constant give-and-take that sustains a healthy relationship. It’s rock-tinged – almost Springsteen-esque – and McKenna totally pulls it off. A “Love Junkies” collaboration (Hillary Lindsey, Liz Rose) that serves as an acknowledgement of “the one” – maybe the one that got away, maybe the one you wake up next to every morning. Either way, the lyrics are startlingly relatable. McKenna skillfully utilizes another metaphor, this time seemingly as a disclaimer about her own shortcomings. Grab The Bird & The Rifle on iTunes.